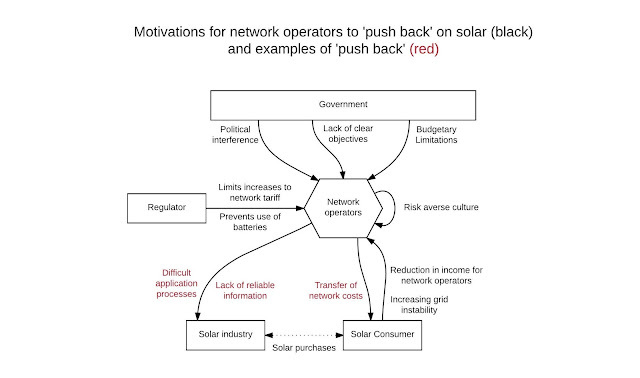 The second last paper to be published as part of my PhD looks at network operators and their potential reasons for 'pushing back' on increased penetration of distributed generation. There are four reasons network operators appear to 'push back' on renewable energy, like solar: it creates technical issues for the network; it reduces the income for network operators; they lack strategic capabilities to make decisions for the future; and because of a risk averse engineering culture. My research did find that individuals can make a difference - particularly those interested in supporting renewable energy from within the organisation, and Ministers with the capability to direct network operators to allow additional distributed generation. My paper is available from Energy Policy, with a free, author's version available until October 20. This website includes links to my research background, work history, and relevant pages and musings on my research. Please drop by my Blog to see what's happening at the moment. I would love to engage with you about my research. You can access my email via my Research Profile, comment on my Blog posts, use the 'Contact me' form or Follow me on Twitter. If you're interested in my research subscribe below for updates to my Blog, publications or anything else exciting. Thanks for taking the time to drop by.